I've been part of several discussions that argue for and against building applications with microservices. In response, I've introduced the below diagram and associated architecture to show the evolution of a distributed system starting from a single application and evolving into several applications and services. Starting with a single application is just as viable as starting with microservices, it simply depends on how much information you're given. So should I start with a monolith or microservices? Well, it depends. Projects could start anywhere on the continuum, typically driven by the amount of information a team has about an application or set of applications. The amount of information is often driven by product/ market fit. The less you know about a given product, which is common for startups or new applications, the further left you'd start. And the more you know about a given product, common when rewriting an existing application, the further right. Large, enterprise business-to-business applications, for example, tend to experience low market risk but often face high execution risk. Hence the tendency for enterprises to start on the far right of the continuum. The continuum is language agnostic and applies to any modern programming language. This architecture helps reduce the cost of changing code as customer needs evolve. It provides developers and product owners the ability to use, reuse, and replace components within a given codebase to both pivot existing products and easily create new ones. The example codebase uses a few select dependencies to emphasise the continuum steps. Understanding the building blocks will help you understand your chosen framework. I've also selected Kotlin as my programming language. I've used a series of Git commit tags to illustrate each step. The example project is a software project management tool similar to Pivotal Tracker. Although not the actual codebase, Tracker followed a very similar evolution in application architecture. I've penciled in a few key epic features - Allocations, Backlog Management, and Time Tracking. I've focused on the back-end development, but there's no reason you couldn't take a similar approach for the front end development. The project includes only a few dependencies and resides within a single Git repository. The v1 tag starts with a flat directory structure. This step, while slightly naive, demonstrates a reasonable starting point having made no decisions around architecture. No groupings, no components, no services. Just a single, flat directory structure with class files. 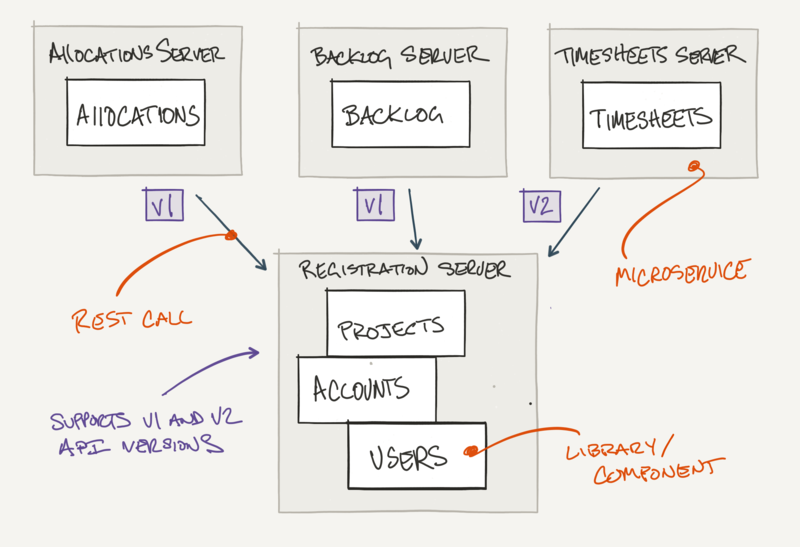 v2 moves classes into Models, Controllers, Data Access Layer, and Utilities directories. I've noticed this directory structure over the years in many popular frameworks, although I've found that as your application evolves, a change to a small feature tends to drive changes through your entire codebase. Would you ever put all your Integers in one file? Functional groups become increasingly painful to maintain as teams grow and the complexity and size of the codebase increases. This is especially true when dependencies are not fully understood. I've found that this is typically the result of accidental design versus intentional design. For this reason, I've reverted the Functional groups commit in favor of v3, Feature groups. The v3 commit moves classes into feature groups or bounded contexts. The benefits of bounded contexts are readability and a step toward isolated (loosely coupled, highly cohesive) components. Imagine you've just joined the team and pulled the next story from the top of the backlog, Update Timesheets. With functional groups, you would have to scan the entire codebase for timesheet related file changes. As the size of your codebase increases, the potential to overlook associated files that also need updating increases. Again, this is especially true as codebases increase in both size and complexity. Using feature groups or bounded contexts, all the timesheet related files are in one place with any complexity confined to a single directory. The step toward single responsibility directories, while small, positions the codebase for v4, individual components with bounded contexts. Design decision I've avoided the use of a "common" or "util" directory in favor of, in this case, jdbc-support and rest-support directories. Common or Util tells me absolutely nothing about the containing classes other than they may be shared by every class in the codebase. Avoiding common, util or similar "generic" directories will allow you to evolve your codebase on a moment's notice. Design decision Database tests re-query the table data after data creation to ensure that records are actually persisted in the database. Design decision Test package names are different than source package names. This is to ensure the intended level of encapsulation and reveal accidental design choices. It should be extremely painful for people to test package / private methods. In the v4 commit I've extracted the Users, Accounts, and Projects components. I've also extracted components for rest-support and jdbc-support, making a conscious effort to avoid creating a "common" package. The main characteristic of the v4 commit is that each component is individually built and tested. This is similar to feature groups (loosely coupled and highly cohesive). Dependencies are clearly described within the build file and circular dependencies are resolved. The v4 commit sets us up nicely to introduce Services. I've created a single databases directory although this is slightly atypical. Data definition language within each component is more common, permitting a per component data store. Design decision I've chosen to create a Jdbc Template over an Object Relational Mapping library. This is because the bidirectional nature of JPA or similar libraries can lead to the accidental introduction of circular dependencies which make it painful to evolve a codebase. Database tables are not necessarily Objects and you shouldn't think about them as such. The v5 commit introduces 4 distinct applications - Allocations, Backlog, Registration, and Timesheets. The Registration Application includes a simple REST API to access Account, Project, and User information. The service itself is very minimal, leaving domain logic within components. The Allocations, Backlog, and Timesheets Applications include a REST API, domain logic, and persistence layer. An alternate structure might have been to create components for each feature group similar to the Registration Application. You'll notice that I've maintained a single Git repo. The single repo significantly reduces the overhead and complexity of API (in-process) versioning while enabling cross-component refactorings. The assumption is that Applications are stateless, well-tested, and able to be deployed with the larger suite of Components and Applications regardless of any local changes. They are also only consumed by the single "large" system. I understand that this topic is slightly controversial although, I highly encourage you to explore having a single repository. A single repository may be beneficial for co-located teams of 6-8 people supporting multiple applications or a distributed system where the overhead associated with managing multiple repos and versioning libraries hurts feature velocity more than the benefits received from autonomy. Be careful not to shift early energy from delivering features - to coordinating repositories and libraries. As your team grows and has natural splits - moving to multiple repos may quickly follow. This especially holds true when teams are no longer co-located and shared libraries lose domain specific knowledge - i.e. shared libraries are now simply support libraries. The transition from step v4 to v5 shouldn't be taken lightly. The move to microservices is more than just an implementation detail and requires real and continued attention. Service availability (retry) and versioning (especially deploying "breaking changes") are just a few of the topics that become top of mind daily. Design decision Components include both Record and Info classes. This is to ensure that an individual component's public API is decoupled from its internal database schema / implementation - i.e. you could change a component's underlying database technology or version an API without impacting existing clients. Design decision You'll notice that Controller classes are located within each component. I've never found a strong reason to keep controllers or data access objects anywhere else other than local to the component - i.e. everything you need to know about a given bounded context is in one place. 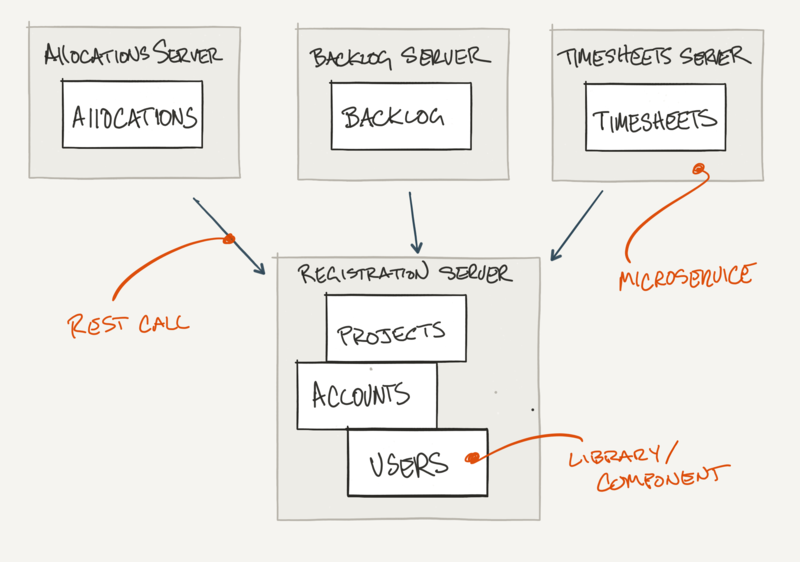 The design decision makes evolving the component to a microservice significantly less painful. The v6 commit demonstrates a microservices architecture with service-to-service communication - Allocations, Backlog and Timesheet applications are dependent on the Registration service via REST. I've found that scaling both teams and performance are typically the main drivers for moving components to services for single systems; reuse, in this case, being another main driver. Reuse tends to be the main driver for moving components to their own repository. Lastly, you'll find an integration or acceptance test that "flows" through the suite of services and a multi-service manifest file for deployment. Design decision I've intentionally duplicated Info and Client classes in each of the Allocations, Backlog and Timesheets components. While your first instinct might be to create a common "project-client" or "domain" component, this duplication sets up for seamless versioning and moving components to separate Git repos as your team grows. Design decision You'll notice that I did not include or commit any configuration or property files; user names, passwords, service location settings, etc. I've intentionally left this to the environment ensuring that the same artifact could truly be deployed to any environment; development, review, or production. The v7 commit moves away from a single database to a database per microservice; Allocations, Backlog, Registration, and Timesheets. Implementing a per component data store becomes increasingly important as you evolve your application along the continuum to a distributed system. Service coupling has been completely removed. Services are now able to manage their own persistence strategy (choice of database technology), schema, and API versioning strategy independent of the other services. Versioning services naturally follows your initial microservices deployment. I've introduced the v8 commit as a guide to service versioning. The Projects component, within the Registration service, has been upgraded to support a new feature in Timesheets - only projects that are "funded" should allow for timesheet submission. To support the new feature, you'll notice the duplication of Info and Controller classes within the Projects component. The V2 API is used by the Timesheet service while our 2 other services, Backlog and Allocations, continue to use the V1 API. Design decision I've used the Accept Header for my versioning strategy. There are lots of debates around how best to publish a new API version; URL, Accept Header, Custom Header. My recommendation is to simply choose the one that best meets your needs. The v9 commit removes the hard coded location of the Registration Service in favor of client-side service discovery. Services register with the Discovery Server via a ScheduledExecutor - while ensuring a 30 second heartbeat. I've implemented the Discovery Server using a standard Redis Set with key expiration. Clients are able to discover services through a simple REST call - client side load-balancing is realized by the random function that I've included on the List data structure. While trivial, the example should give you insight into how service discovery works in practice. 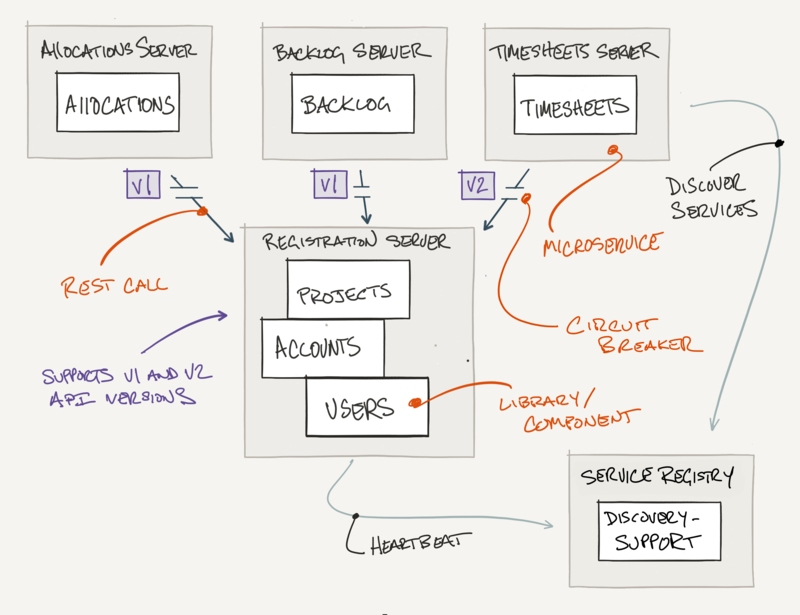 Design decision I've chosen client-side service discovery over server-side service discovery. Both patterns support service autoscaling, failures, and upgrades - as well as dynamically assigned network locations. The v10 commit introduces the circuit breaker pattern. I've used a single-threaded Executor with a timeout to demonstrate the basic behavior. If the circuit is open and not ready for retry the circuit breaker will immediately call the fallback function. If the circuit is closed the circuit breaker will call the desired block and only call the fallback function when the maximum time to wait is reached. Typically there would be one instance per commend that is thread-safe. I tend to start all new projects with the 3 top level directories - applications, components, and databases. While following the continuum, I've found that the first few steps happen so quickly, weeks versus months, that it is easier to start every project with a component based directory structure. For Kotlin or Java projects, I tend to use gradle and include gradlew - resulting in the below initial directory structure. The components directory is a conscious effort to continually drive individuals toward a mindset of loosely coupled, highly cohesive components. The directory helps you explicitly decide where you have coupling between components and why. Components are compiled and tested independently - eliminating the chance of introducing circular dependencies between components. That's a wrap! Assuming you're on board with the continuum, I'm hopeful the project has given you insight in how an application evolves over time. Applications may start anywhere on the continuum depending on how much information the team has at the start of the project; greenfield applications without product /market fit may start left while big existing product re-writes may start on the far right. Functional groupings could prove challenging when evolving along the continuum. Finally, it's also worth mentioning that not all applications need to evolve and could stop anywhere on the continuum. Thanks to dajulia3, enocom, shageman, and austinbv for reviewing early drafts. © 2018 by Michael Barinek. All rights reserved.